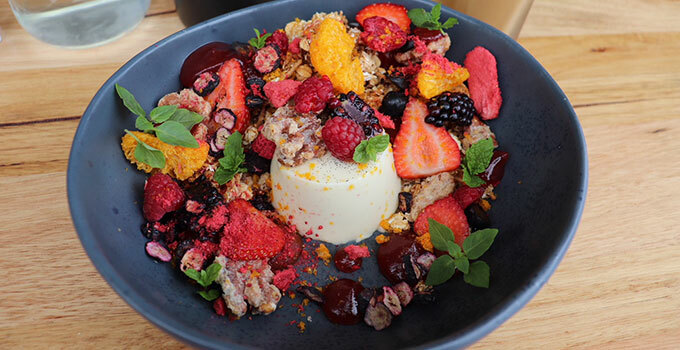 Danish delights meet modern Australian cafe flair at Freja’s in Wilston. Serving a sophisticated all day breakfast, Freja’s will have you munching on brunch and celebrating all things hygge in no time. The menu offers an abundance of savoury and sweet options, served with the culinary flair to be expected when two chefs of Stokehouse are behind the stove. This isn’t ordinary café food though, with their almost fine-dining presentation style already snapped and spread across the Gram by Brisbane foodies (us included). The sweet dishes on the menu read like a dessert challenge from Danish Masterchef and we’re certainly not complaining! Banana bread comes with chocolate banana soil and honey mascarpone. Matcha pancakes are served with white chocolate, macadamia, berries and blueberry coulis. Pear waffle comes adorned with vanilla ice cream, candied walnuts, rosemary and balsamic. And the impressive maple roast granola is definitely one to try, accompanied by a vanilla and cardamom panna cotta, mint and stonefruit no less! Freja’s Danish heritage shines through savoury dishes like smoked salmon on light rye with fennel, sous vide egg, pickled onion and samphire. The pulled beef cheek croissant with green tomato and lime aioli may seem entirely out of place on the streets of Paris, but it is sure to become a staple on the Brisbane café scene. And you simply cannot go past their fried mushrooms with potato rosti, asparagus, souse vide egg and wild rice crumble – a dish that is vigorous on the taste buds but unexpectedly light on the stomach! Stop by and enjoy a cup of 7 Miles Coffee (roasted locally in Newstead) and soak up the unmistakable charm of Danish hospitality. Say Heja to Freja between 6am to 3pm Tuesday to Sunday, located at 3/1 MacGregor St, Wilston.